Do you take church seriously? Many men don’t. A lot of churches make it very difficult to. But you should, and here is why: whatever the reality of church is for you, corporate worship also involves participation in heavenly reality. The Bible presupposes that when we gather together in worship, the Lord Jesus and his elect angels are present as well (Mt 18:20; 1 Tim 5:21; 1 Cor 11:10; Heb 12:22–24; 13:1–2; Rev 1:20). This was the idea behind constructing the temple as a throne-room after the heavenly model, with God seated between the cherubs (e.g., Ex 25:22, 40; Heb 8:5; 1 Sam 4:4; Ps 80:1; 99:1; Num 7:89). Just as worshipers at the temple were participating in the heavenly court “on earth, as it is in heaven,” so worshipers today enter into the presence of God and his angels when they meet together to break bread. This is the significance of John receiving his Revelation on the Lord’s Day; he was caught up in the spirit to the heavenly reality in which he was already invisibly participating. Regardless of the reality of church “on the ground,” we must therefore take worship extraordinarily seriously. If we really are coming before God’s throne, into his very presence, and if we are surrounded by the great cloud of witnesses (Heb 12:1) that comprise his heavenly court, then do we dare dismiss this, or treat it as a light thing? Should we not come in all reverence and fear? In the west, we have largely abandoned the fear of the Lord, and it shows in how we enter his presence. The idea of “Sunday best” is treated as a joke. Why make an effort to have one’s best clothes clean and ready on Sunday morning, when you can just grab whatever is left from the laundry? We are told that what we wear has no meaning at all. The outside doesn’t have anything to do with the inside. So men come to worship in Hawaiian shirts and beach shoes, or tee-shirts with funny prints. Women wear pants that might as well be paint, or skirts designed to expose the maximum leg. And Paul’s command to cover the head as a sign of submission and deference is treated as a humiliating relic of the dark ages, from which the enlightened advent of feminism has gloriously freed us. On the other end of the scale, many red pill Christians have abandoned meeting together for online community. 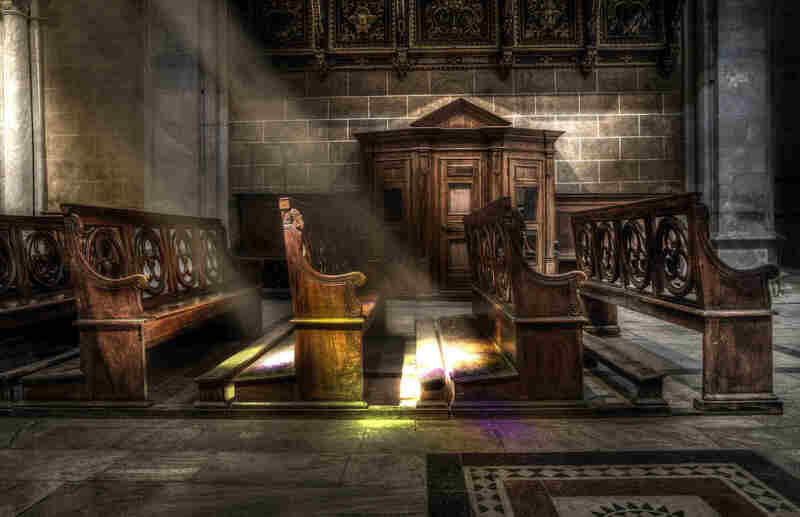 “This is my church,” one deceived fellow recently commented on Dalrock’s blog. But it is not. Assembling together is an embodied experience, because God made us embodied creatures. You cannot break bread on a blog. You cannot share the right hand of fellowship on a forum. You cannot greet contributors with a holy kiss, nor pray together by lifting holy hands. You are not visited day and night to be exhorted with tears by anonymous pundits. And your online avatar is not a temple of the Holy Spirit. Typically it is verses 24–25 that receive focus in these discussions, on how we are to stir up one another and not neglect meeting together. Certainly those are sufficient to prove that Christians ought to approach God corporately on a regular basis; contextually this refers to agape-meals, which today we’d call the Lord’s supper at church. But the whole thought sequence is instructive. It begins by noting that since we are able to come before the presence of God through Jesus—there is no longer a curtain separating us—we thus should draw near in the full assurance of faith. But notice how we do this: there are two aspects. The first corresponds to the full assurance of faith: we draw near by holding fast to our confession (v. 23). The second corresponds to drawing near itself: we come before God’s presence by meeting together and building up one another in love and good works. The two are intimately related: it is impossible, in the author’s mind, to both unwaveringly hold fast to our confession and come before God rightly, without meeting together with other Christians. We cannot be stirred up to love and good works without embodied input from our brothers and sisters. Love is not a solitary activity, and we cannot claim to love God if we do not love his family (cf. 1 John 4:20–21). Yet the passage does not stop even there. In verse 26 it makes a truly dire claim. If we go on sinning after receiving the knowledge of the truth—the knowledge, in this particular passage, that we are not to neglect drawing close to God by meeting with his family to stir each other up to love and good works—there remains no forgiveness for sins, but rather the fearful expectation of judgment! This is no idle matter; it is a question of salvation itself. Meeting together is not a suggestion; it is a command, and if we refuse to fellowship with other believers, we are about to trampled in the winepress of God’s fury. Whether, and how, you worship is a public declaration of your place before the Lord. This has significant implications for any man, and especially for men with households. If you don’t think participating in God’s heavenly court matters, then going to church doesn’t matter. If you don’t think your children participating in the heavenly court matters, then sending them out to Sunday school doesn’t matter. If you don’t think that your attire in the heavenly court says anything about your attitude to being involved, then dressing casually doesn’t matter. If you don’t think that the parts of your body you uncover in the heavenly court matters, then head coverings don’t matter. But if it were an earthly king, and you were gathering in his earthly throne-room, with his earthly dignitaries…would we take it more seriously, or less? Men, church may not feel like a place where you go to report to your King, worship him together, and receive instructions for building his house or advancing his rule. That is because very few congregations have treated their assembling together in this way for a long time. “Doing church” has lost its head, and become about making women and children feel good. But the only way to restore the head, to bring the reality on earth into line with the reality in heaven, is for men to start taking the heavenly reality seriously. To restore the head. We’re not saying the problem will magically fix itself if you do this. We’re saying doing this is the necessary beginning to fixing the problem. We’ll have more ideas for practical steps in other posts.